This week we’re thrilled to bring back to work of Audio Epics – the Belgium-based audio drama troupe headed by Domien De Groot and Eline Hoskens (and featuring the splendid musical talents Peter Van Riet). 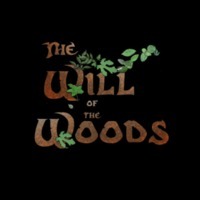 This five-part series is Will of the Woods, the story of elves (not quite the Tolkien variety) who live happily and untroubled in the mushroom houses that grow on an enormous tree in the middle of the Infinite Woods. They are led by the wizard Saffredon, the eldest and wisest living among them. All inhabitants of the tree trust his wisdom and counsel, especially his young pupil Nuzwick. Despite Saffredon’s attempts to teach Nuzwick about the Will penetrating the very fabric of the Woods, Nuzwick’s mind dwells on Myrilia, a girl he’s [not so] secretly very much in love with. From the creators of The Witch Hunter Chronicles, here is a new, lushly imagined audio drama fantasy for you based on the Flemish Audio Drama “De Wezens Van Het Woud”, published by Audio Epics in 2007.